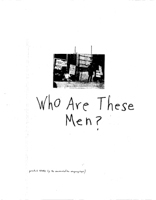 Title: Who Are These | Men? Abstract: The title is the caption for a photo of demonstrators on City Hall steps (Black Panther Party?) Two arrows pointing to two individuals in the photograph presumably are the focus for the question. Trans Title: Who Are These | Men?